In our last article on Facebook’s algorithm change, we identified influencer marketing as experiencing a rapid rise in importance. Good news, right? WELL, it’s debatable, because among the encouraging articles, like this one by Forbes, there is also horror stories. 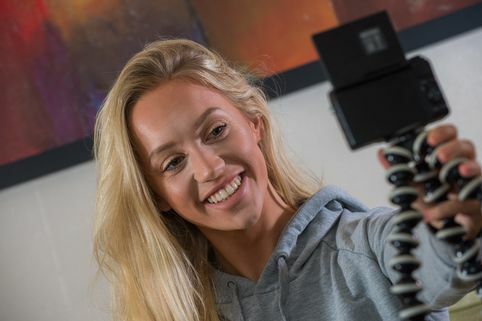 If you haven’t already heard about Elle Darby in the national press, you’re about to see a perfect example of influencer marketing gone wrong. Elle Darby is an accomplished influencer with an audience of over 200,000 combined followers. Those who are familiar with the term ‘influencer marketing’ will also know the perks of the job. Which more often than not, include; complimentary access to events, products to test and free hotel rooms. At the end of the day, influencers provide a valuable and rapidly increasing MARKETING SERVICE. They are not just ‘free loading kids’ looking for freebies. 60% of consumers surveyed by Medium said they had been influenced by a social media post or blog to make a purchase*. 48% of marketers surveyed by Hubspot said they will be adding vloggers into their 2018 marketing strategy*. 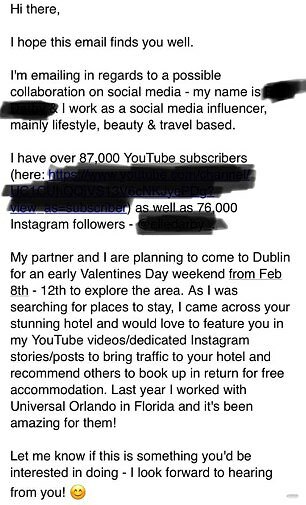 Elle was exposed by hotel owner Mike Stenson, for sending a proposal email asking him to accommodate her at the White Moose Cafe/Hotel in Dublin. In exchange for the room Elle would feature the company in her vlog, which on average receives 30,000 views per video. The important thing to consider here is many hotels and brands are in fact interested in this type of proposition. 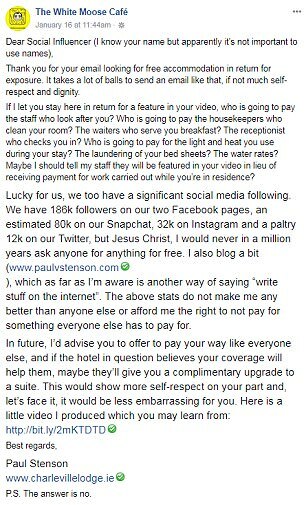 Furthermore, it’s not uncommon for the influencer to even be paid for the work. Therefore, there’s usually no harm in asking. However, in this case, asking has sparked a national argument. In response to the email, the White Moose Cafe (who has now banned all bloggers and influencers from the business) outed Elle and posted the exchange online. Sparking a monumental debate and serious controversy on both sides. Elle’s ‘forward’ but quite frankly, normal and well-written email has left her with an inbox full of death threats and abuse. The White Moose Cafe now also sells merchandise based on the story, alongside sending Elle Darby a £4.6 million invoice for the ‘exposure’ they’ve given her. Furthermore, doing a poor job of ‘scrubbing out’ her name, which exposed her real identity and began a torrent of online abuse. 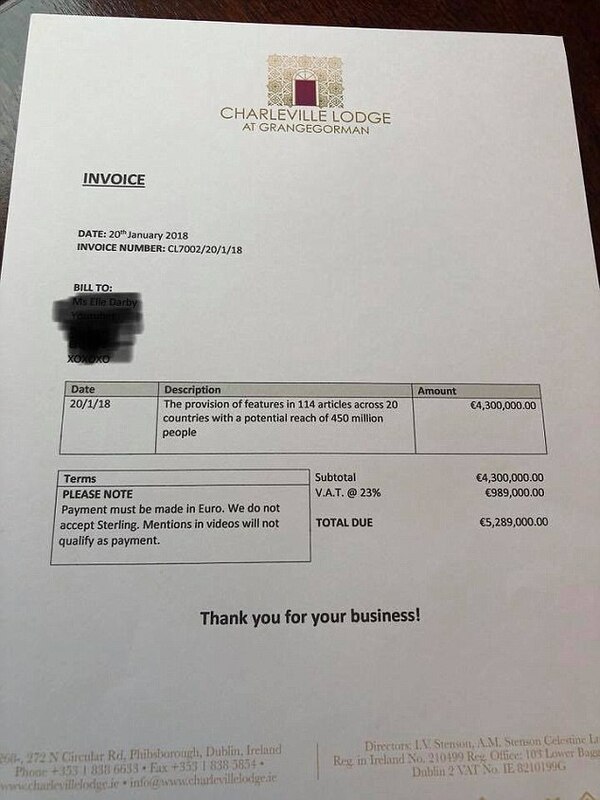 The invoice, released by the White Moose Cafe during the scandal. Exposing Elle’s identity through her ‘poorly scrubbed out’ name, which became the catalyst for a barrage of online abuse. The answer to this question depends on how well you understand the term ‘influencer marketing’. Unfortunately, there is a clear trend when reading the comments, which seems to pitch the old vs the young. Now, as social media experts, Momentum understand this is not the case within the professional industry. However, there is a worrying trend within the general public, including business owners. Who meet the growing form of marketing with extreme negativity. The problem here is simple; a lack of knowledge ending in a poor reaction to a pretty normal email proposal. If you’re a brand that doesn’t see influencers as valuable, that’s completely fine. However, Momentum would like to remind you that in a case like Elle Darby, a simple ‘no’ would suffice.